This silent newsreel footage from Gaumont News, a French company, shows several sets of dancers doing a quadrille in an outdoor setting. To the tune of "Johnny in the Low Ground" and "Turkey in the Straw," the Boys and Girls of '61 Dance the Steps of Their Youthful Days. Contributor Jim Saxe notes, "This clip raises more questions than it answers. What was the occasion for this dance? Was it some isolated thing like Brigadoon appearing and then vanishing into the mist, or are we seeing people who engaged in this sort of recreation (or re-creation) on a somewhat regular basis? The 1919 date places this event well before the Shaw era and also before Henry Ford started promoting old-fashioned dances. But is what we're seeing part of a surviving tradition that played any part at all in creating fertile ground for the Shaw-era revival when it eventually came?" Saxe also points out that dancers are doing a waist-hold swing, not a two-hand turn and that at least one pair of dancers appear to be doing a buzz-step swing. 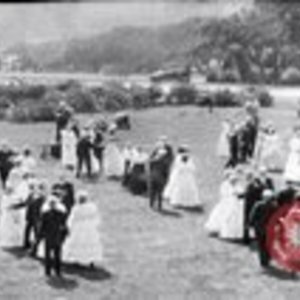 Gaumont News, “Square Dance, Oakland, CA - 1919,” Square Dance History Project, accessed April 24, 2019, http://squaredancehistory.org/items/show/1597.